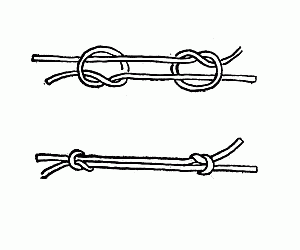 The Fisherman's knot is a specialized bend. It consists of two overhand knots wrapped around each other. It requires little dexterity to tie, so is often used in stubborn materials. When tightened, it becomes fairly compact, and the free ends can be cropped very close to the knot. These qualities make it very useful for fishing line--it is less likely to jam a fishing rod than many other bends, and is easier to tie with cold, wet hands. This page was last edited on 21 October 2016, at 00:15.